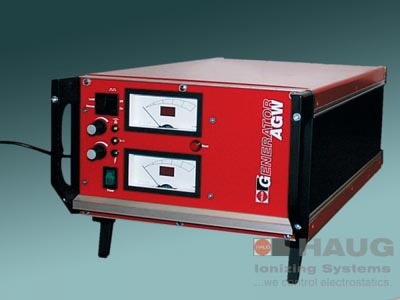 The charging generator AGW / AGW PUR Profibus is a high-voltage generator which is used in combination with HAUG charging electrodes type ALW and a suitable counter-electrode. The charging electrode must be attached at a distance of 10–30 mm above the material to be charged, exactly opposite the counter-electrode. Where a grounded counter-electrode is used, this counter-electrode must make contact with the material to be charged. In order to achieve a continuous, controlled fixation of the two materials, we strongly recommend that the materials to be fixed to one another be discharged before charging using a suitable HAUG ionization system. The charging generator AGW / AGW PUR Profibus generates a stabilized, adjustable high voltage of up to 25 kV and supplies a maximum output current of 2.5 mA. The units are available with positive and negative polarity. On the AGW, the voltage and the actual flowing current are indicated on the integrated digital measuring instruments. In the case of the AGW PUR Profibus, these measured values can also be output through the bus system. The output voltage and the maximum output current of the AGW can be set optionally using two potentiometers or an external control voltage. The charging generator AGW can be pulsed externally. The integrated communications socket allows a signaling device to be controlled. The AGW PUR Profibus allows the output voltage and the maximum current to be adjusted through the bus system. All functions of this unit can be controlled via a Profibus system. for fixing films and foils on packaging machines / film welding machines. for fixing films and foil on turrent film winders, for fixing the wound film against telescoping and glueless commencement of the film winding process on cardboard tubes.